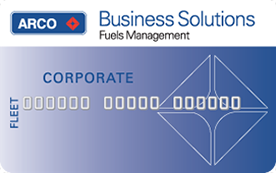 Our Business Solutions Fuel Card provides fleet managers with detailed reporting and individual spending controls. Accepted at over 1,500 participating ARCO locations in the United States. The ARCO Business Solutions Fuel Card gives fleet managers the ability to restrict fuel purchases to fuel only to prevent convenience store purchases. Transactions cannot be approved without a PIN, only fleet managers can gain secure online access to driver account information. Lost or stolen cards may be deactivated immediately via our website. With the ARCO Business Solutions Fuel Card, you’ll receive invoices online free of charge. You’ll also have 24/7 access to transaction information through our exclusive, easy-to-use website. Gain purchasing control for each card, including the ability to shut cards off, request new cards, or change gallon limits by card. Monitor after-hours purchases, daily transactions, and daily dollar amounts for your drivers. Your personalized system may be set to flag purchases made outside the established limits.